As you take your seat and release the throttle, the sheer power is overwhelming. While the bike is determined to slice through the air and accelerate at alarming rate, wind resistance tries to hold you back where you are- your body is undecided whether to go with the bike or stay back. It takes a few moments to come to terms with the mean machine at your command. But then, it is not so difficult either. Harley Davidson Street 750 is the cheapest Harley one can buy in India. Being entry level Harley, it is not the biggest, most powerful one that only macho men can handle. Anyone who can handle a bullet can comfortably ride a Street 750. I drove around Bengaluru and nearby and answered "How much does it give" question for over 100 times in 2 days. Few care about price and CC, but everyone wants to know its mileage... Ride was fun. Bike was at ease both in city and highway. Look on the kid's eyes when he got a short ride on Harley! Rear passenger seating is not very convenient. The Always ON headlights prompt everyone to blink their fingers at you advising that you turn off the light- that is not possible, so get used to it. No side stand warning and engine starts even when side stand is ON. So be careful about this. Overall I had a wonderful time with the bike for 2 days. Thanks WickedRide for facilitating the same. Don’t worry, I am not switching gears and started to write blogs on movies. Neither am I a die-hard fan of SRK nor do I have a girlfriend who hails from Tamil Nadu. Most of my blogs have been inspired by some person or the other, be it the Leh ride or Harleyride or Bhutan ride. But here, just for a change it is not because of one person or event that I partook this ride. It was a chain of events which led to this ride. · And finally the movie, Chennai Express in which this bridge was shown. That’s it, and I said to myself ‘no more waiting and I am doing this ride’…..and the movie was the final nail in the coffin which is why you find the title ‘Chennai Express’! 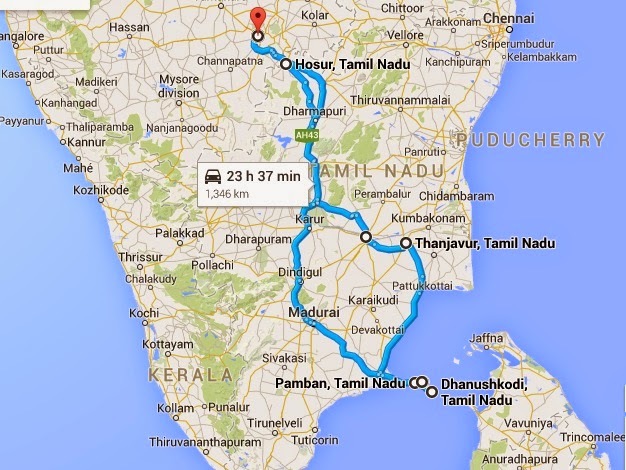 And just for your information, I was nowhere near Chennai in the whole ride. As always, I expressed my wish/desire/dream of this Rameshwaram ride with my friends and wanted to see what the headcount was. This time the headcount was fluctuating like the share markets! Sometimes it went up and then came down crashing. But I had decided if nobody turned up, I will do this ride alone. Finally with lot of postpone (three times to be precise) and additions/deletions, I had nine friends who agreed to do this ride. This figure was new to me and challenging. I had never managed such a number on a trip and was looking forward to do this. Out of nine I had two of my buddies/riders from Harley Ride, MH700 & Drugs Baba. The remaining friends were my colleagues with whom I was riding for the first time. As the date approached few of them had to cancel the bike plan and opt for car due to the pressure from parents. So finally it was decided that we have three bikes and one car. I had the responsibility of planning for this ride which included: route, accommodation, expenses and food. With inputs from few of my friends, Vikram Mallesh and Google I was ready with the plan which was for three days. I was satisfied and happy with the plan except for the last day which had 650 Km of distance to be covered!!! I was confident about my backbone and bum, but was not sure about the other riders. This was one chance I had to take if we really wanted to cover all the places as per the plan. The plan was to kick start from Kengeri Satellite Town at 04:00 in the morning. We over shoot this by an hour and left from Kengeri around 05:00 with a brief introduction of each other. I had laid down few simple rules this time as we were ten of us and few of them were riding for the first time on such a long trip. The rules ensured that we never hit more than 80 KMPH and also made sure that one or the other person was either back or in front. We hit the NICE road after paying the toll and all were strictly following the rules. I was shocked to see Mithun going slow for the first time in his car!!!! Around 07:00 we reached Saravanna’s hotel on Krishnagiri road which pulled us automatically like a magnet, thanks to our early departure from Bengaluru. Everybody was damn hungry and would have killed each other for breakfast if we had continued further. The food served was delicious, especially the different types of chutney which we get with the dosa and idli. Everybody was fully satisfied with their tanks full and wanted to hit the road ASAP before the sun came out. From there we headed to Trichy and the sun really got better of us. We badly wanted to escape the irritating and humid conditions by reaching our destination ASAP. The sun rays were so torturous and the heat so high that we could as well have put egg omelet on our fuel tanks! We could feel the heat waves that was hitting us and our skins were literally burning. Only good thing was the roads. Full credit goes to the government and the people who have maintained the roads to such wonderful levels. The people are also very helpful and honest. At one instance we got back our valuables which by mistake we had left at the temple. The guys came searching for us on bikes and gave the valuables. I was moved by their honesty. The items were worth at least rupees 10 k! But one annoying thing which was we all had to face was the bad road mannerisms. This is something very common in many states but here it was few notches above. People rarely looked up or sideways to check for vehicles and cross the roads. At few instances I had to steer my bike from them on the highway. Also the cabs/taxis rarely honk when overtaking and pass very close by to you. One has to be extra careful and cautious. We had a quick visit of Ranganatha Swamy temple and then headed straight to Tanjavur. For the first time I crossed the speed limit and was in a hurry to reach hotel. I badly wanted a shower as my body was sweating like hell and the smell --- 100 rats could have died! It was same with others. It was 18:00 we checked in at a hotel and the facilities offered were good. We had only one hour to get ourselves ready before the Brihadeshwara Temple closed for the day. Luckily we made it in time and were able to spend some quality time at the temple. The ambience is so calm and soothing that for a moment we forgot the whole day’s ride and also that it was Tamil Nadu state! For the first time we guys were to separate from each other…. And the reason was our taste buds. Few wanted veg and few non-veg. As per their preferences we made two teams and both the teams came back with a heavy stomach and only thing on their mind was sleep. Today was a big day for most of us and especially to me. I will be finally seeing the famous Pamban Bridge which had haunted me over the past couple of months. What was funny is that the entire ride had numerous temples and even the final destination, Rameshwaram is one of the famous religious place. But for me it was all about seeing the Pamban Bridge. Not that I an atheist or non-temple visiting guy but I was more fascinated by the famous bridge. We left early in the morning around 06:00 and took the wonderful ECR stretch (East Coast Road). The early morning ride on those smooth tarmac is a blissful experience and with RE Thunderbird 500 there was no stopping. Finally after few hours of ride we reached our DESTINATION or rather my DESTINATION – Pamban Bridge. The stretch where you see the bridge is a picturesque one with water on both the sides. As soon as you reach the bridge, you are greeted by numerous small boats on the right and on the left you find the famous railway track. We were lucky to see a train pass by as we reached the bridge. I couldn’t have asked for more!!! More? Yes, I wanted more and for the very same reason I came back again in the night to spend some time. It was one amazing experience sitting under the moon and chatting with buddies. Our laughter could as well have echoed in the neighboring country Sri Lanka, all thanks to Preamble Dileepa. We spent close to two hours standing there and enjoying the view. There were all possible photo poses that we got clicked and it was only after sometime that we realized there was Dhanushkodi also waiting for us in the day’s plan. We quickly headed to check in to our hotel and got fresh in no time. I suggested that we skip our lunch and head straight to Dhanushkodi so that we can spend more time. The stretch from our hotel to Dhanushkodi is another treat to riders. We could see water on both our sides as we took the bikes to the last known piece of land in this ride. The feeling is awesome and my happiness knew no bounds as I kept pushing through those roads. From Dhanuskodi we had to take Van and when somebody asked me, Why not bike? I had no reply for some time. But as we got into the van and started our journey to the last known piece of land, all I had to do was just turn back at my friend and the answer was self-explanatory!!! Most of my colleagues wanted to taste the waters of Indian Ocean but I preferred to enjoy the ambience. We decided to walk till the last patch of the land. The view of the ocean and the sound of the waves hitting the shores is an enriching experience. As my friends continued to walk, I just laid down there on the sand bed to enjoy the view. It was 17:00 and we had to return back to our van. On our way back we collected few shells from the seashore. In no time we reached back to our bikes and from there we headed straight to the Rameshwaram Temple. The temple was about to close and luckily we managed to enter in time. The temple is a gigantic structure and the carvings are breath taking. It is famous temple down south and is one of the famous four pilgrimage destinations in India. We all were very hungry and more so those who tasted the Indian Ocean waters… we had our dinner at a hotel in front of the temple which served good vegetarian food. Many of them hit the bed after coming back but I wanted to visit Pamban again. Along with me Dileepa, Chiranjit, Vibhas, Mihir and Arun also joined. We spent close to two hours and had our best time of the entire ride. It was around 00:00 in the midnight that my eyes were burning and we decided to head back to our hotels. Next day was a demanding one for all the riders. Few of my friends wanted to visit Rameshwaram temple and complete the 22 theertham bath. I was very tired to wake up and do the same. I and few others continued to sleep. I finally woke up at 09:00 and by then Mihir had also come with laddoos (prasadam). I said to myself, what a way to start off the day. Since I have made a habit of collecting something as a memory from my ride, I headed to the local market to do some shopping. I got a pen stand made of shell with Rameshwaram engraved on it and also few items for home. From there I went to the house of Dr. APJ Abdul Kalam, the missile man who is an inspiration to millions of young Indians. There are numerous of his achievements on display and what caught my attention was the number of doctorates. I stood there and took a count of it. The final number was a cool 40!!!!! People including me die to get just one PhD in our life and here is a man who has 40 to his name. Wish I could borrow one from him! I took a key chain which had the engraving of this great personality and thought this will be the best one to sit with my new bike. 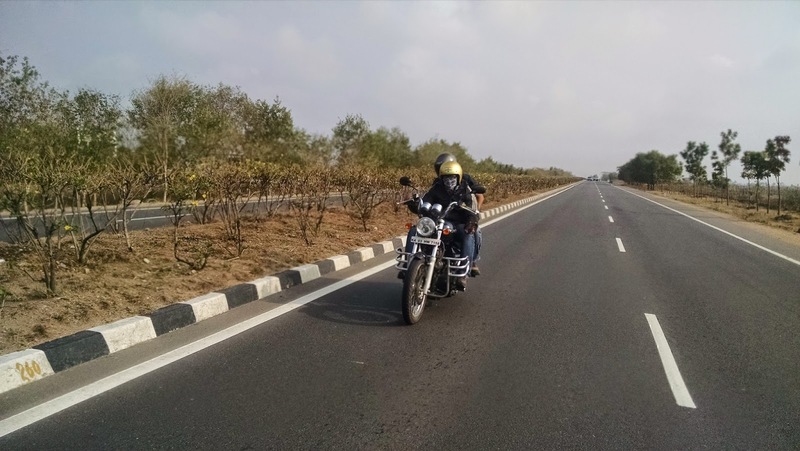 As I complete this blog and ride, I have my partner for the rest of my life: my love, my dream and my ride – Thunderbird 350 cc. So from next ride, it will be me and MY bike! We left Rameshwaram around 12:00 in the afternoon and finally bid adieu to Pamban Bridge. From there it was a non-stop ride to Bengaluru and one of the most challenging rides. The heat was at its peak and the temperature refused to die down. By now I had lost few more shades of my skin color. I guess that is the price you pay for these kind of rides. We reached Bengaluru next day early morning 04:00 and the entire stretch I was on bike. I had to mentally and physically push to ensure that there was no problem to other riders. Along with me, Mihir, Vibhas & Dileepa were equally strained but we refused to stop till we reached Bengaluru. Thanks to my all friends who were so adjusting and ensured that we stick to the plan. Kudos to all the riders and also Mithun for driving his car non-stop. After this ride, there is a sense of pride and achievement. Though the hangover (sleep deprivation) was there for few days, it was totally worth it. Looking back, I have Leh (North), Darjeeling & Bhutan (East) and Dhanushkodi (South) under my belt. And what next? It is obvious and imperative on me that I touch the Kutch… ops, west. Don't forget to check out wickedride.in for fulfilling your dream ride.